Home All World record Olympic Gold for Usain Bolt! Usain Bolt became the first ever male 100m Olympic gold medalist for Jamaica and he did it in world record time lowering his previous record to 9.69 seconds! Jamaica was well represented in the finals with Micheal Frater also qualifying and running a new personal best and breaking the 10 second barrier for the first time ever for a commendable 9.96. Asafa Powell repeated his fifth place finish from the Athens in 2004 with a time of 9.95 seconds. 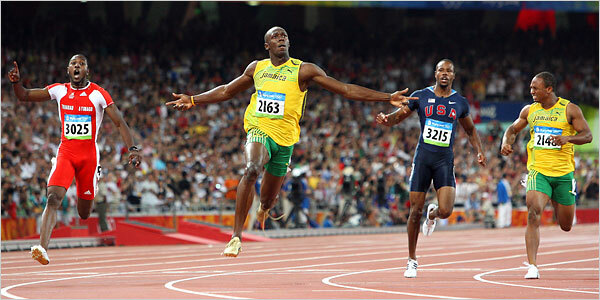 Usain Bolt will continue his quest for the double Olympic gold when he lines up for the 200 metres. Congratulations Usain, well run Asafa and Michael!